Travelling provides a relaxing escape from the monotony of daily routine. Regardless of where your trip takes you, the experience is guaranteed to broaden your horizons and give you fresh perspectives on various aspects of your life. However, some parts of travel are undeniably tedious and less fun, not the least of which is carrying your luggage and belongings through airports and other public places. This is further compounded when the bag you’re carrying is poorly-made and lacks the basic requirements for comfort. Fortunately, travel bags were designed with the sole purpose of facilitating the process of packing and carrying travel essentials. This article will go over some of the main features of these valuable travel accessories and will help you pick the best travel bag on the market. The process of picking a travel bag might seem like a simple task at first glance. The truth of the matter, however, is that you need to be familiar with some of the essential qualities and characteristics of these bags if you want to make sure that you are getting the best possible option for your money. A common mistake that many people make is focusing too much on the design of the travel bag and neglecting more critical factors such as the durability of the materials and the quality of the stitching. 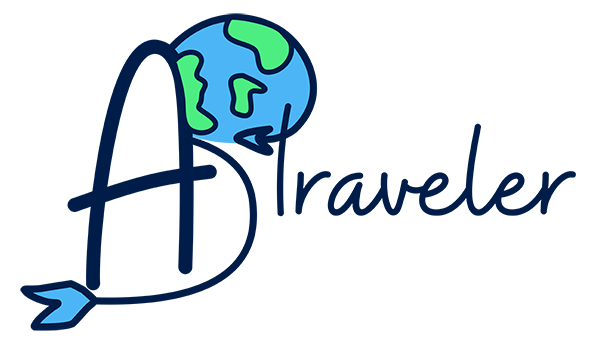 Below is an in-depth look at some of the most important factors that you need to take into account while selecting a travel bag. Regardless of how you intend to use the bag, size is an important aspect that you need to pay attention too. For travel purposes, you generally need a bag that is large enough to hold a significant percentage of your items. It is generally advisable to opt for travel bags that have a capacity of over 50L. 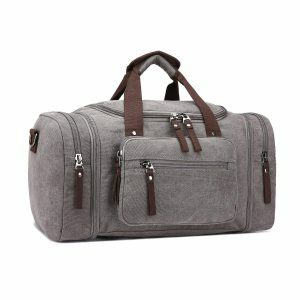 If you are planning to use it as a sports bag or as a supplementary bag, a smaller option might be able to do the job. Travel bags are often subjected to a tremendous amount of wear and tear and the rough handling by users and airport personnel can damage several parts of the bag after only a few months of use. That is why the quality of the stitching should be one of the first things that you look for in a travel bag. The width, depth, and consistency of the stitching are all indicators of a well-made best travel bag. This is only important for people who plan to use the travel bag in the outdoors. Before buying a particular bag, make sure to first read the manufacturer’s description to see if the material is waterproof or not. It is essential to note that real leather should be avoided due to its permeable nature. Carrying a travel bag for an extended period of time can be extremely strenuous. It can leave you with sore palms, tired shoulder muscles, and a low level of energy before the trip has even begun. The right travel bag needs to provide utmost comfort and should come with a removable shoulder strap that has a good amount of padding. The handle should be made from soft materials and needs to be designed in a way that allows for easy gripping. Zipper pockets offer a lot of convenience to travelers and contribute to increasing the bag’s overall capacity to hold more of your belongings. Practical zipper pockets should be spacious enough to hold various items such as shoes and toiletries without pressing too much into the interior compartment or compromising the shape of the bag. While functionality and durability should always take precedence over any other factor, it is essential to keep in mind that best travel bags need to be stylish as they are constant companions of travelers. This is ultimately subjective, but generally, an ideal travel bag should complement your overall fashion style. 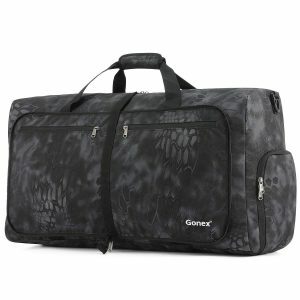 This product from Gonex has all the qualities of a top travel bag. It is made from high-quality Cordura fabric and is extremely durable. Its sturdy composition coupled with its tremendous water repellency makes it an ideal bag for a wide range of uses. While it is primarily designed for traveling, its versatile design, relatively large capacity, and overall quality allows it to serve as a multipurpose sports bag, an airplane carry-on, an overnight bag, or even as a shopping bag. Definitely one of the best carry on travel bag. The Gonex 80L Packable Travel Duffle Bag combines two qualities that are highly valuable for travel; a compact design and a spacious interior. It is fully foldable and can be compressed into a fraction of its original size. Once unfolded, the bag expands to an impressive size of 27.6 x 14.6 x 14.2 inches. This is spacious enough to fit a substantial amount of your belongings. Durability and functionality aside, the bag boasts a sleek design that is very fashionable and up to date with the latest trends. It comes in 9 different unique and eye-catching colors that you can choose from, such as typhon, purple, gold, and rose red. It also comes with an internal end-pouch and shoe compartment and is equipped with a long removable shoulder strap. Gonex are confident enough in the quality of this product to offer a 100% satisfaction and money back guarantee. As part of their commitment to customer satisfaction, the company will offer a full refund for any returned item within the first 30 days and will provide all their clients with lifetime customer service. Plambag has been a leading brand in the space for quite some time now. This latest offering from the company is made from high density cotton canvas with real leather trim. It is remarkably compact and light and more importantly, it is extremely durable and well stitched. The bag was designed for use by both sexes and is large enough to hold laptops, A4 books, and various other bulky items. The Plamgbag is ideal for use as a travel bag or a gym bag. The exterior of the bag has two side zipper pockets on the front and one on the back. The design of the zippers is also worth noting, they are easy to handle and are smooth to pull. Comfort wise, the handle is easy to grip and is made from soft materials that don’t feel cheap and unpleasantly rough in your hands. Furthermore, the included removable shoulder strap is highly practical and makes carrying the bag feel effortless even when it is full. It’s definitely worth to be the best duffle bag for travel. 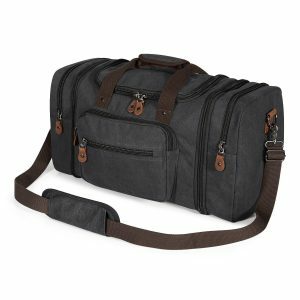 This is another affordable travel bag that is destined for both men and women. It is suited for a wide array of uses that range from serving as an overnight bag or a weekend travel bag, to a sports duffel bag or a gym tote bag. It is made from thick and durable canvas that can resist the wear and tear that accumulates over years of traveling. 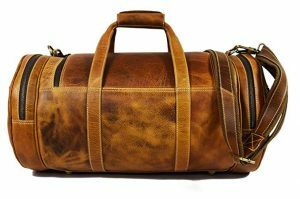 The overall level of craftsmanship that went into the making of this duffel bag is simply outstanding and the design itself has an unmistakable elegant and vintage feel to it. Could it be your’s best duffel bag for travel? Keep reading! As far as capacity is concerned, this bag delivers on so many levels. The Toupons’ capacity is around 50L, which is spacious enough to hold all the items that you would need for a short 3 to 4 days trip. 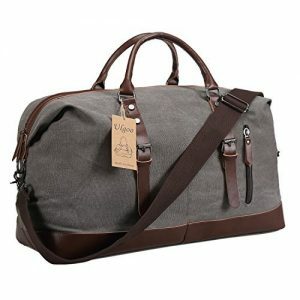 Moreover, the bag’s capacity is further enhanced thanks to the 9 pockets that are sewn into all sides of the duffel bag. Unlike the vast majority of travel bags in this price range, the shoulder strap of the Toupons is well-padded and feels extremely sturdy and comfortable. This American-made bag is one of the top picks in our list. It is made from premium full grain leather and is designed to withstand the strenuous nature of constant traveling. The design of the bag has an undeniable raw yet elegant feel that works well in both formal and casual settings. The stitching is simply immaculate, employing some of the highest quality threads in the market. Additionally, brass buckles, buttons, and YKK Metal zippers were added for extra sturdiness and durability. Another aspect that sets this product apart from the competition is the fact that each unit is made entirely by hand. The Leather Travel Barrel is spacious enough to serve as your main travel bag. The interior compartment can hold the bulk of your essential travel items while the zipper pockets on each side can be used to carry more compact objects such as a first aid kit and toiletries. When it comes to stylish and multi-purpose bags, few companies can do it better than Ulgoo. This travel bag is made from a unique combination of cotton canvas and top quality PU leather and the sturdy construction is perfectly reflected in its rugged and minimalist design. It has ample space to hold the essential travel items of two people and has a total of 5 pockets where smaller belongings can be placed. A good number of manufacturers tend to neglect the handle of the bag. A poorly-made handle often creates discomfort when carrying the bag and can even cause it to rip under the pressure. Ulgoo has avoided these issues by equipping their units with soft PU leather handles that are firmly attached to the bags. The detachable shoulder strap that is included in the package is well-padded and can be adjusted according to your own preferences. All the options that we reviewed in this guide combine the three essential qualities of a best travel bag; a durable construction, a spacious interior, and a sleek design. As far as intrinsic value is concerned, there is very little that separates these well-made bags from each other and you can pick the one you like the most without worrying about any compromise in quality.